Israel's prime minister has accused Iran of carrying out a missile test in "flagrant violation" of a UN security council resolution. Benjamin Netanyahu said he would raise renewing sanctions when he meets US President Donald Trump in February. Iran has carried out several such tests since a 2015 nuclear deal which relaxed sanctions against the country. It is not yet clear what type of missile was launched, or if it explicitly violated the UN resolution. A 2010 resolution, which barred Iran from undertaking any work on "ballistic missiles capable of delivering nuclear warheads", was terminated after the nuclear deal with six world powers was implemented. It was replaced by a new resolution, 2231, that "calls upon" Iran not to undertake any activity related to "ballistic missiles designed to be capable of delivering nuclear weapons". The UN Security Council is to hold a meeting on Tuesday about the missile launch, at the request of the US. In a recorded message on his Facebook page, Mr Netanyahu said "Iranian aggression must not go unanswered". Mr Netanyahu is a fierce critic of the nuclear deal with Iran, which calls for the eradication of the Jewish state. Benjamin Netanyahu's condemnation of the Iranian missile test is clearly intended to push the new Trump administration to take action against Tehran. Iran will be high on the agenda when the two men meet in mid-February, though it is as much Iran's regional activities as its missile programme that worries the Israelis. Iran's missile tests are controversial. While they do not break the terms of the nuclear deal between Iran and the major powers - this did not cover missile development - they may well be a violation of UN Security Council Resolution 2231, which calls upon Iran not to undertake any activity related to ballistic missiles capable of delivering nuclear weapons. 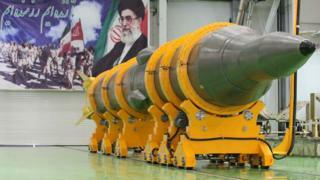 The Iranians insist that, since they have no plans for nuclear weapons, the tests are not prohibited. Iran's launch may well force Mr Trump to give a clearer indication of what practical steps he intends to take against Tehran. Iran has not commented directly on the missile launch. When asked about it at a news conference on Tuesday, Iranian Foreign Minister Mohammad Javad Zarif said only that "the missile issue is not part of the nuclear deal". Iran says its nuclear programme is purely for peaceful purposes, but world powers suspect it of seeking to develop nuclear weapons. The White House said it was studying the details of the incident. US officials, speaking on condition of anonymity, said the missile had broken up before the test was completed. But US Senator Bob Corker, chairman of the foreign relations committee, said: "No longer will Iran be given a pass for its repeated ballistic missile violations." Mr Trump has previously called the Iran nuclear deal "a disaster" and suggested his administration will abandon it. But that has drawn criticism from senior figures, including the former director of the Central Intelligence Agency, John Brennan. Mr Brennan, who stepped down when President Trump took office, told the BBC late last year that tearing up the agreement "would be the height of folly" and "disastrous". But Mike Pompeo, who has succeeded Mr Brennan as director of the CIA, was a prominent critic of the deal.